The Ross's Turaco, also known as Lady Ross Touraco (Musophaga rossae), is non-migratory and native to the open woodlands, riverine forests and humid forest edges of Angola, Burundi, Central Cameroon, Gabon, Guinea, Nigeria, North Botswana, Rwanda, Sudan, the Democratic Republic of the Congo (formerly Zaire), Uganda, Western Tanzania, West Kenya, West to Mouth of Congo River, South to Northern Zambia, and the Central African Republic. This species is relatively common in parts of its range. Ross's turacos prefer the canopies of dense trees where they are agile climbers. They are extremely territorial and aggressive to other birds, including raptors. They occur in pairs or small groups but flock in feeding trees where groups will feed on wild or cultivated fruits. Their diet also includes flowers and young shoots, termites, and snails. 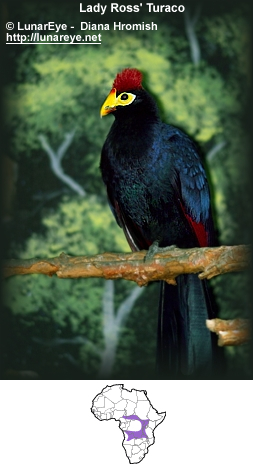 Ross's Turacos typically measure between 51 and 54 cm (~20 inches), and weigh between 390 and 444 grams - making it the second largest of all turaco species, even larger than the Violet Turaco. . Other differentiation from the Violet Turaco include the impressive red erectile crest, yellow lores (the regions between the eyes and bill on the side of a bird's head), and a yellow beak which stretches posteriorly to form a forehead shield. The yellow coloring continues, to form a periopthalmic ring. Its body is a violet blue-black color, and the legs and feet are black. The sexes are alike so these birds should be surgically sexed or have DNA feather testing performed. Continuous, throaty somewhat monkey-like sound containing a regular beat. Both males and females build platforms nest using twigs in an isolated tree up to 52 feet above the ground. The hen lays 1 to 2 eggs and male and female share in incubating them for about two weeks. The young fledge after a month. These turacos are extremely popular as in aviculture due to the relative ease of their captive management, their interesting and active behavior, and the beautiful brilliant red of their underwings, and the dazzling color exhibited by some of the species. They appreciate large well-planted aviaries to feel secure and to allow them to fly and ho from tree to tree. 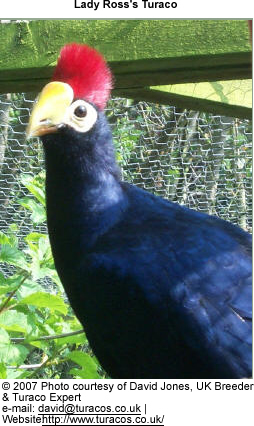 Turacos may be kept with other large softbills or game birds, but they may occasionally show aggression towards other birds. Touracos become sexually mature in their second or third year, though some hens may lay eggs in the first year. When forming pair bonds and breeding, they should be closely watched for aggression towards each other, which sometimes even happens between long-term partners. It is best to furnish the birds with a sturdy nesting platform or basket. The female lays from one to three off-white eggs at two-day intervals. Incubation is from 24 to 26 days, and both parents share in the incubation of the eggs and the raising of the chicks. The plumage of the babies consists of a black down covering their body and legs. The frontal shield and bill was black, fading to a rich yellow. At about three to four weeks of age, the violet of the breast, wings and tail starts, the red on the undersides of the wings and the crimson color on the crest begins to show. These birds are primarily frugivorous, and a good diet will consist of a mixture of freshly diced fruits such as apple, banana, papaya, grapes, plus chopped greens and soaked raisins*. (*AvianWeb Note: Raisins have the potential of toxicity in pets if fed in too high a quantity. Caution is advised) Their food should be sprinkled twice weekly with a vitamin/mineral supplement. Soaked dog chow, dry mynah pellets, and game bird crumbles are also provided. The birds are also given mealworms and other insects while breeding.